It is mid week already and you know what that means? It's time for another edition of What's Hap-"Pinning" Wednesday where you can link up and share your favorite Pinterest finds or just simply anything that's on your mind! I've been on a craft kick lately for Miss A's nursery and got a couple of Pinterest DIY's done earlier this week. We're so close to moving her upstairs so that she can sleep in her room but for some reason I'm just not quite ready. I definitely want to wait until we get the blinds installed and custom valances made so that's my excuse for now. Anyway, I wanted a cute lamp for her shelf because currently her room doesn't have wiring for an actual overhead light (so odd I know...) so we have a cute pink gingham floor lamp we found on sale at Target and that's it. Ya'll lamps are weirdly expensive! All the ones I wanted were like $50 and over and I just couldn't pull the trigger on that for a small lamp. Improvise time! I bought a cute little $8 lamp at Wal-mart and then broke out the old faithful glue gun and some rosettes from Hobby Lobby to add just the right amount of pink! I'm thinking I took it to at least the $30 level since I spotted a similar one at Target for around the same price. I love it! grainy phone pics...still haven't decided on camera yet! That' my Christmas project! Next, I realized I needed something to hold or store her bow headbands. Hair clips are easy because you can clip them to pretty ribbon and hang them but she has no where near enough hair for those yet (bless her heart) I scanned Pinterest and found a super cute tutorial for a headband holder and I dove in! The only thing I would change is the can used - it is sort of flimsy and definitely not long enough for her 1,000s of headbands. Maybe substitute something sturdy like an old wooden piece/column type of thing? 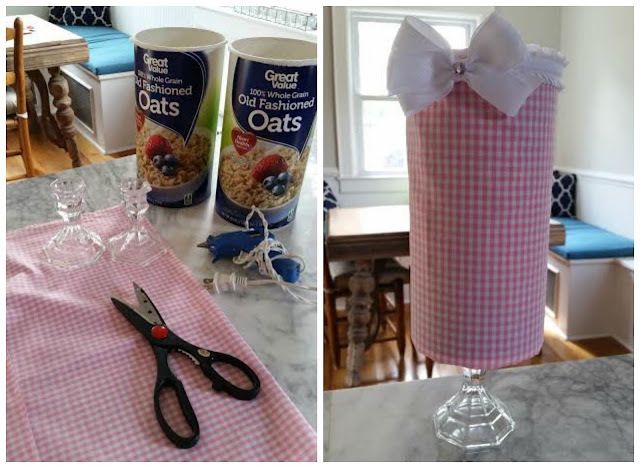 Any how, grab a rolled oats can, some cute candelabras that you can score from Dollar Tree, hot glue and the fabric of your choice and BAM! You have a headband holder and a cute accent piece for any room! Thanks for stopping by (head over to partner-in-crime now at Going the Distance) and be sure to join in on the fun and link up with us below! You are so crafty adorable, lady! :)! That is so creative! Love it! You are so crafty, it's not fair! That headband holder turned out so cute and I love all her little bows! 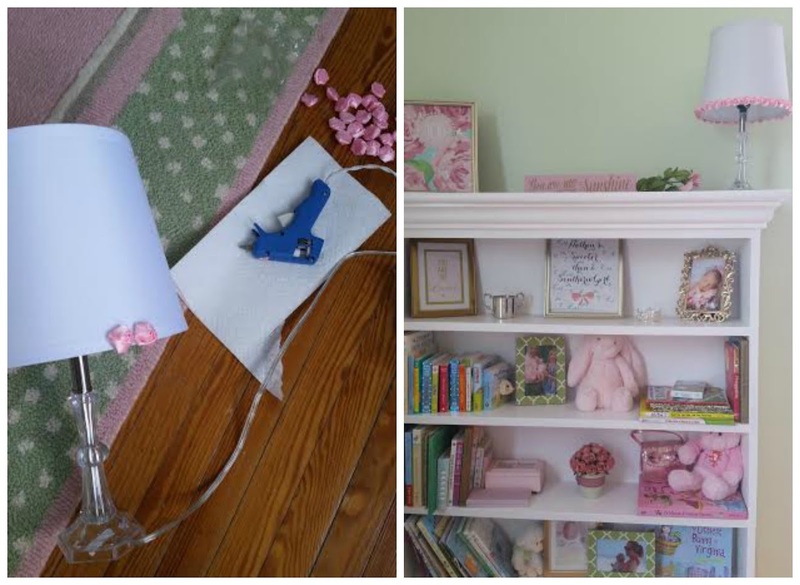 I love that you are adding so many DIY touches to the nursery! That are perfect! The headband holder is adorable - great idea! I love how crafty you are. Ok those headband holders came out so good!! Andi's room is so pretty!! I love all the pink. Love your crafts for Andi's room! They turned out adorable! I wish I had your craft skills! Everything is looking so cute and adorable. Just stumbled upon your blog and I love it! Love this link-up as well! I'll have to see if I can get something together for the next one! Darling! 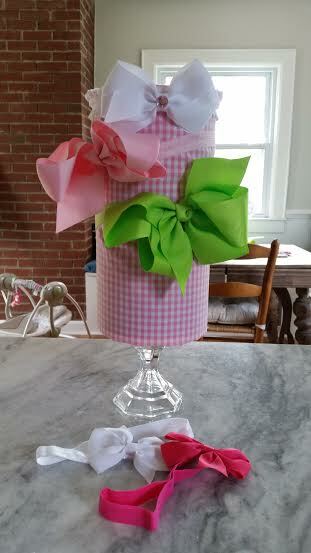 I love your creation - it's perfect for those sweet bows! Cracking up over here it's like little girls problems right? How do I store all her adorable head bows? ;-) I love your solution! Ummm is it too over the top if I have a bow lamp also? Like, the big one with the big bows all over it? Adorable!! seriously, why are lamps so expensive? it's so weird! love the lamp and the bow holder! that is so creative. You're right: lamps are stupidly expensive! The one you DIY'd is so cute! And OMG boy mom here: I totally didn't even think about a place for headbands! (Duh!) If we ever have a girl one day, I'm definitely doing this. What a great idea for a head band holder..... Don't you just LOVE Pinterest??? That is so creative and cute! Great idea! That headband holder is adorable! It is surprising how expensive lamps are too. 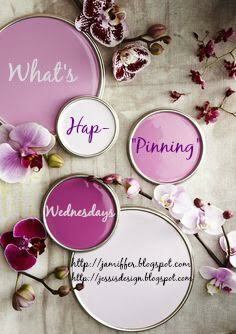 Love your DIYs!